The Acer RG270 sets itself apart from other 75Hz gaming monitors by offering an IPS panel with wider viewing angles and vibrant colors. We’re glad that this model is now bringing IPS technology to the lower-priced category which was previously ruled by TNs that are faster at the cost of viewing angles and color. The Acer RG270 still costs slightly higher than it’s counterparts, but it’s irresistible pricing warrants a peek at how much value the product holds. The Acer RG270 sports a minimalist design that’s elegant looking when sat next to it’s black and red-donning gaming models. The monitor comes in matte black with a finish that’s nice to the touch and easy to maintain. Acer’s attempt at reducing the borders is also very apparent, with the frame measuring 7mm on the top and sides to make them less noticeable. The chassis also shares the modest proportions, with the upper half looking almost as thin as an OLED TV. The bulge is more prominent, but it’s less than 40mm thick unlike those found on some competitors from other brands. The device also consumes less desk depth, making it easy to push closer to a wall for more keyboard space. One of the things we dislike about the Acer RG270 is its use of bottoms on the bottom bezel which can sometimes be troublesome for users. It’s understandable and reasonable since this is a budget model, but we don’t think that adding a joystick could affect the pricing. The Acer RG270 is held up by a T-shaped base and a stand mechanism that only offers tilting adjustments. The articulation point is placed at the bottom of the upright, so you might have to move the monitor depending on your chosen angle. However, you can remove the stand and utilize the VESA bolt holes for aftermarket armatures if flexibility is necessary. The Acer RG270 includes an essentials-only I/O panel consisting of a DisplayPort 1.2, HDMI 1.4, and a VGA port. You also get a pair of 2-Watt speakers which are underpowered for gaming, but surprisingly holds its ground and doesn’t distort even at high volume levels. 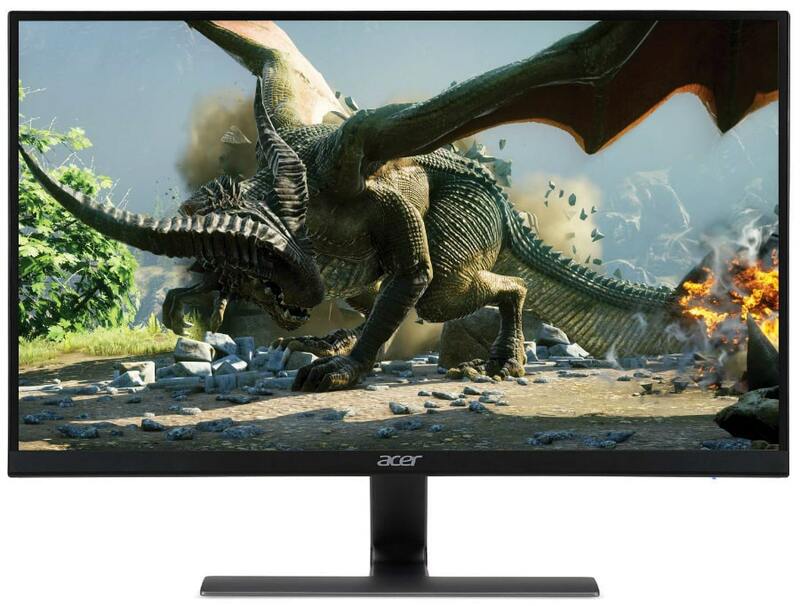 The Acer RG270 boasts a 27-inch IPS panel with a 1920 x 1080 HD resolution, 75Hz max refresh rate, and 4ms response time. The screen is backed by a 250cd/m2 LED unit and a contrast ratio of 1000:1 for decent viewing performance. The immediate flaw of this mix is the low pixel density, which makes pixels visible and softens the image if you sit too close. But we’ve mentioned before that larger 1080p screens have value for games where reaction time counts more than visual qualities. It’s easier to see small objects like head peeking at you in CS:GO or an incoming projectile in Overwatch if the screen is less sharp. Of course, games like these are better played with 144Hz variants which are faster, but the Acer RG270 is an excellent start. 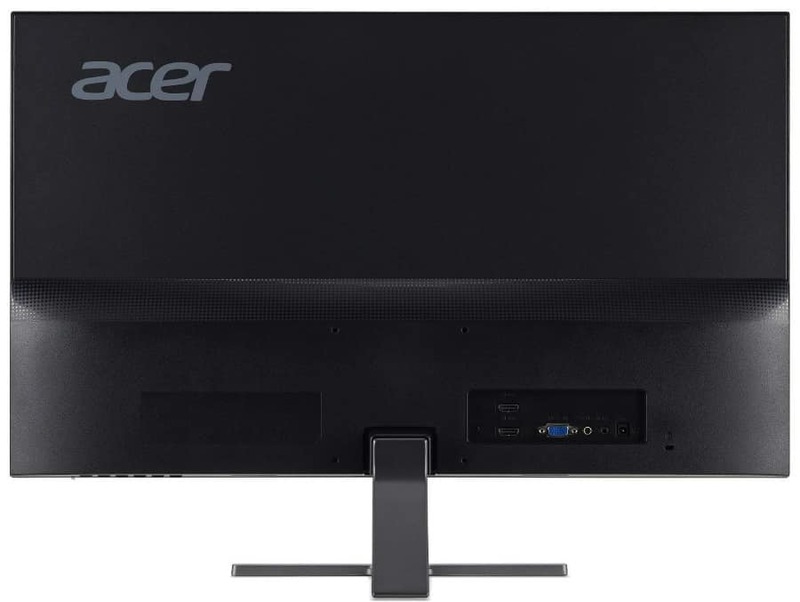 The Acer RG270 posts impressive imaging scores for a budget monitor right out of the box. The IPS panel is able to reproduce 98% of the sRGB gamut, with a fantastic accuracy average of only DeltaE 1.95. Calibration isn’t necessary since it will only improve the score to DeltaE 1.8, bearing no visible improvements for the product’s intended uses. The display’s Gamma which sits very close to 2.2 yielded a superb grayscale performance with minor errors which won’t be noticeable to most users. The Acer RG270’s contrast hits close to 900:1 which isn’t the best IPS result we’ve seen, but fall within reasonable standards. The screen looks vibrant and well-balanced, so we can say that wanting something better will cost considerably more. Our test unit of the Acer RG270 had little to no bleeding on the edges, but panel uniformity is average, at best. Brightness deviances stayed within 15% for most of the quadrants, affecting dark or all-black images. However, the color remained even and unaffected for typical use, and the flaws are only noticeable if you inspect the display thoroughly. The Acer RG270 is branded as a gaming variant, and it performs superbly if you keep your expectations within reasonable limits. The excellent color and gamma of the display add a nice touch of vibrancy and depth to games like Overwatch or CS:GO. However, we think the display’s specifications make it more suitable for slower-paced titles like the Witcher 3 or Ghost Recon Wildlands. Even if the Acer RG270 is operated at 75Hz with FreeSync, there are some noticeable blurs when panning the view rapidly. This limitation is born out of the limited refresh and the panel’s slower pixel response time, but it shouldn’t bother most users. 75Hz offers decent improvements to in-game motion, but a 144Hz display will always be better in handling blurring and ghosting. The Acer RG270 is even suitable for E-Sports use due to its average input lag of only 13ms which doesn’t translate into delays. We did not experience any “de-synced” instances so the only limitation you have to consider is the limited refresh. The Acer RG270 is an excellent monitor when image quality is concerned due to its fantastic color reproduction and Gamma rating. The fact that it’s an IPS variant is also a huge selling point since this panel type is sorely missing in the lower brackets of the gaming monitor category. The size stretches the limits of the 1080p resolution, but we think it’s still suited for games like CS:GO. One thing that would bother some buyers is the Acer RG270’s $250 price average which could get a 144Hz model like the Acer KG271. However, this new model is a great buy if you value excellent colors and general image quality over a high refresh rate.